Families and children did not make a regular appearance in Star Trek until TNG premiered in 1987 with the introduction of Dr. Crusher and her son, Wesley, in the first season. Despite current conversations focusing on the nuclear family, we know that families come in all shapes and sizes and can be comprised of many different people and relationships. Star Trek provides examples of this, but in particular, several main characters who have children* happen to be single parents including Dr. Crusher, Worf and Sisko. From that short list, it is interesting to observe that 2/3 of these characters are single fathers. When discussing single parents, we tend to think of the mothers raising their children on their own. But fathers are certainly doing it as well and they need to be included, especially black fathers. The stereotype of the absent black father has been prevalent in national conversations; however, the data shows that black fathers tend to be more involved in their children’s lives than fathers in other racial groups. Benjamin Sisko is shining example of this truth. The only black man to lead a Star Trek series is also the only commander/captain to have the added duty of raising a child while in command. From Kirk’s bumbling attempts to mentor the youth, to Picard’s impatient encounters with children, Star Trek captains had not yet shown themselves to be up to the task of parenting. In general, fictional dads are often portrayed as stern disciplinarians, authoritative figures or worse, incompetent. 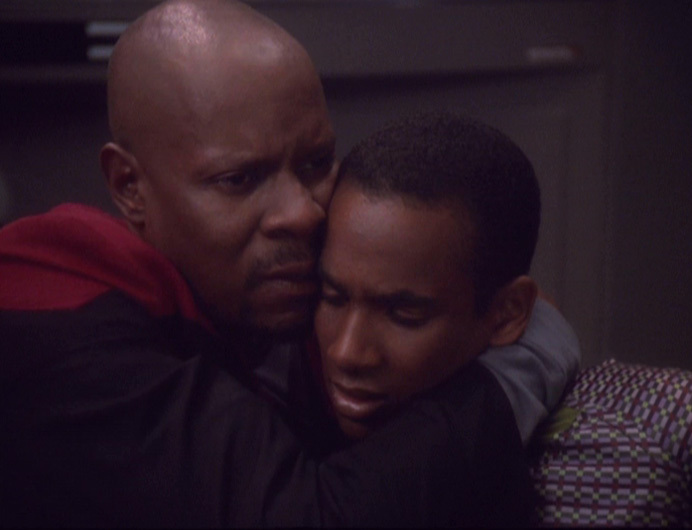 So it is meaningful that Sisko is introduced immediately as a warm and tender father to his teenage son, Jake. The emotional bond Sisko and Jake share is strong, and it is both touching and refreshing to witness their affectionate relationship. They also share a deep trust and mutual respect in each other, something not often depicted between parents and teens. Although a Klingon in the Star Trek universe, Worf is played by black actor Michael Dorn and as such, deserves mention here as well. Their relationship is more strained and Worf tends to struggle more to connect with his son, Alexander. Part of this stems from Worf’s internal conflict with his own identity. Having been raised by human foster parents and then joining Starfleet, he adamantly strives to balance those aspects of himself with adherence to Klingon culture and customs. This causes him to force these values on Alexander, who wants nothing to do with that. Another part stems from the fact that Alexander was raised by his (half human) mother before her death put him in Worf’s permanent care, so they lack the history that Sisko and Jake share. 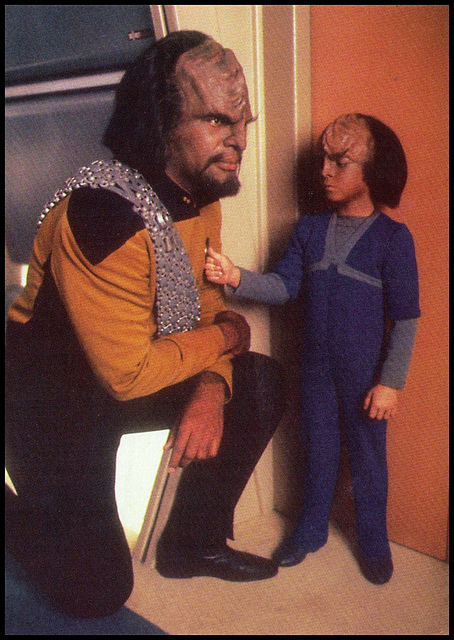 Nonetheless, Worf ultimately wants the best for his son and spends a lot of time with him. Parenting is a different journey and experience for everyone and men are often forgotten in conversations concerning the raising of children or even blamed when problems arise (“daddy issues”). If you have ever listened to “The Danger of a Single Story” (if not, I recommend that you do) you know how important these representations of single fatherhood can be and it is a testament to the diversity of stories in Star Trek that Sisko and Worf exist. I noticed when browsing lists of black fathers on TV they often celebrate the dads in family-oriented shows (Good Times, Family Matters, etc). While those characters are certainly excellent examples of fathers, it is heartening to know that in a series set in the future, where the primary cast is not a family but a bridge crew whose mission is to explore the galaxy, amazing dads also exist.